For those who like to know floor plans, this house has four floors: 1) the garden level with a dining room and kitchen, 2) the parlor level with an entryway and living areas; 3) the third floor with a master bedroom and dressing room/bathroom, and 4) the fourth floor with a nursery and office/guest room. Here’s a photo of the exterior, from the back. On first impressions: When we first saw the house, it felt 11.5 feet wide. It was really dark, and all the walls were a natural brick color. But we were like, okay, we can make this work, it will be fine. The minute after we bought it we were like, wtf this is a cave. 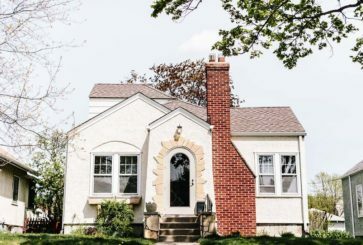 On renovating: We ended up doing a pretty big renovation. Our genius architect friend Tal would come over for dinner and we’d talk about designs for hours. It was a really wonderful, collaborative process. Tea kettle: Le Creuset. Counter stools: DWR. On making a small kitchen feel bigger: The ceilings are pretty low — like eight feet — so we felt like magicians trying to make the space feel bigger. We painted the brick walls and overhead beams white, which immediately opened up the room. We also put in open shelving, and we have a hidden fridge, which is tucked under the island. Not having a big fridge makes the room feel much cleaner. On classic meals: We’re terrible at cooking consistently, but when we have people over, we’ll make classic dishes — roast chicken, a pretty great bolognese. If I’m hosting friends for dinner by myself, I’ll just put out lots of yummy little bites, like cheese and olives. Wallpaper: Paper Mills. Pendant lights: Roll & Hill. Table: SP01. Chairs: DWR. 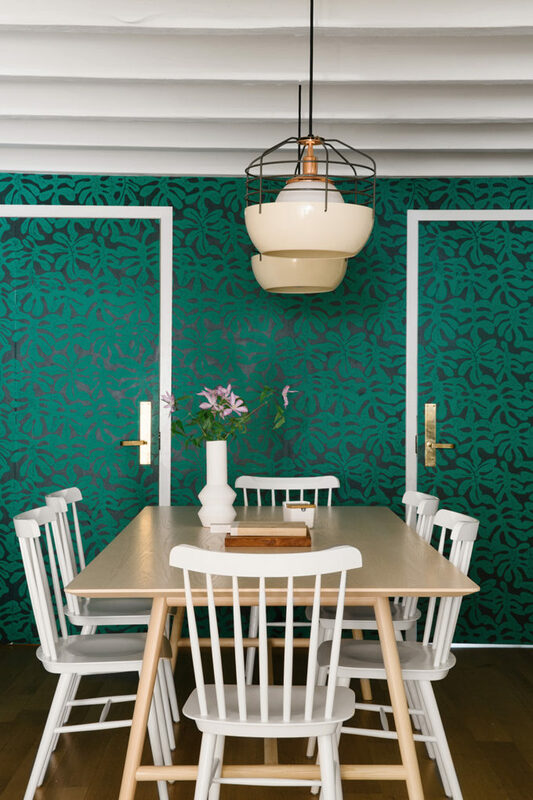 On a wallpaper trick: We wallpapered not just the wall but the two doors, too (one goes to a street entrance, and one leads to the boiler room). It makes that wall so much prettier than it would be otherwise. Rug: Nomadno. Fleetwood Mac lyric print: Made by friends. Bear photograph: Tamas Dezso. Striped pillows: Hedgehouse. Chair: DWR. Hot pink cushion fabric: Svensk Tenn. White vases: similar. Radio: Tivoli Audio. Child’s push toy: Hape. Black woven toy basket: West Elm. 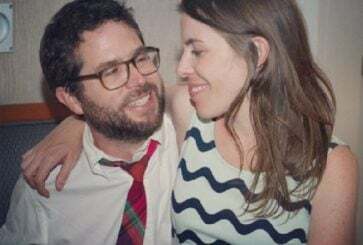 On hanging as a family: Our daughter’s name is Ophelia, but we call her “Ophie.” When I was pregnant, Gideon came up with the name after listening to the song Ophelia by The Band. We hang out here together all the time. Sitting with a kid on the floor isn’t that comfortable, but with these big pillows, we can get down and play. She’s into serving us pretend food. She makes me burgers, but she’s always out of fries. On personal art: The pink poster is a Fleetwood Mac quote. My husband, Gideon, worked with a designer friend to make it for my birthday. We want to do more posters with song lyrics that are important to us. We sing the final verse from Forever Young to Ophie every night, and we’d love to make a print and put it in her room. Purple paint: Farrow & Ball Brassica. Bed: DWR. Quilt: Matteo. Sheets: West Elm. 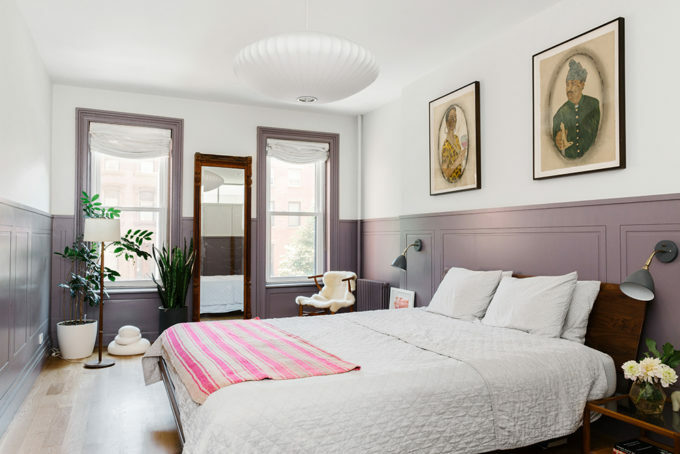 On signature colors: The purple wainscoting in our bedroom is higher than usual and so dramatic. Purple and pink weave through the whole house; my friend calls it the calmest rainbow. There was actually a point when we had even more purple – including the door frames — but Gideon said it looked like Monica’s apartment on Friends. Bedside table: vintage Paul McCobb; similar. On a comfy bed: We sleep with a very light quilt, even in the winter, and we have mostly linen bedding, which I like a lot. I like a cool, dry bed. Not a sweaty bed, never a sweaty bed. Pendant lamp: DWR. Window shades: custom. Portraits: Frohawk Two Feathers. Striped pink throw blanket: similar. Wooden wishbone chair: vintage Hans Wegner; similar. Sheepskin throw: Overland. Floor lamp: vintage; similar. Sculpture by Stef Halmos. On evening routines: I don’t know how other people are, but by the time we battle Ophelia into bed, it’s 8 or 9 p.m. and we’re wiped. We often get in bed to read or watch TV on the laptop. We were very, very into Game of Thrones. We also just started The Good Place. It’s absurd and surreal and funny. Dresser: Paul McCobb, from eBay; similar. Rug: Nomadno. On a dressing room: My husband has a closet in our bedroom, and I have the dressing room across the hall. I love spending lots of time getting dressed. It’s the best. It was never ever something I thought I’d have, but it worked out that way! On smart stairs: The staircase goes up through the middle of the house, dividing each floor into two rooms. The original staircase was very dark, so we rebuilt the whole thing from scratch. The glass partitions open up the spaces and let the light flow across the rooms. Pendant lamps: Atelier Areti. Faucet: Brizo. Tiles: Waterworks. On penny tile: This bathroom might be my favorite thing in the house. Pretty early on, Tal was like, we can make your bathroom beautiful with simple penny tile and a smart design. So we made a colorblock pattern. We also added black faucets, which feel elegant. The house is pink and purple, but still not girly — little details like this are why. On the shower: Tal matched the marble on the counter and tub with the penny tile, so the color would be uninterrupted. I love showering here so much. There’s a big window, but the bottom half is frosted. I guess the neighbors can see you washing your hair. Wallpaper: Ferm Living. Crib: Oeuf. Rug: vintage; similar. Green chair: DWR. Pillow on chair: Aelfie. Pouf: Target. Bird art: Emilie Clark. Baskets: West Elm. On kids’ wallpaper: This was the hardest wallpaper to choose. We didn’t want something overly gendered or cute or severe. We had a few false starts, but then found this one. I like a big pattern in a small space — it’s a paradox, but somehow it makes it feel bigger. Tal had the cute idea of making the blinds a Creamsicle tangerine color. On bright rooms: Ophelia’s room has a skylight, but we never got blackout curtains or a white noise machine. We wanted her to be able to sleep in different ways and places. She’s still not the best sleeper, but thankfully she sleeps through bright light. Shower curtain: similar. A-frame shelf: Custom by their friends Adam Frezza & Terri Chiao. Penny tiles: daltiles. Mirror: similar. 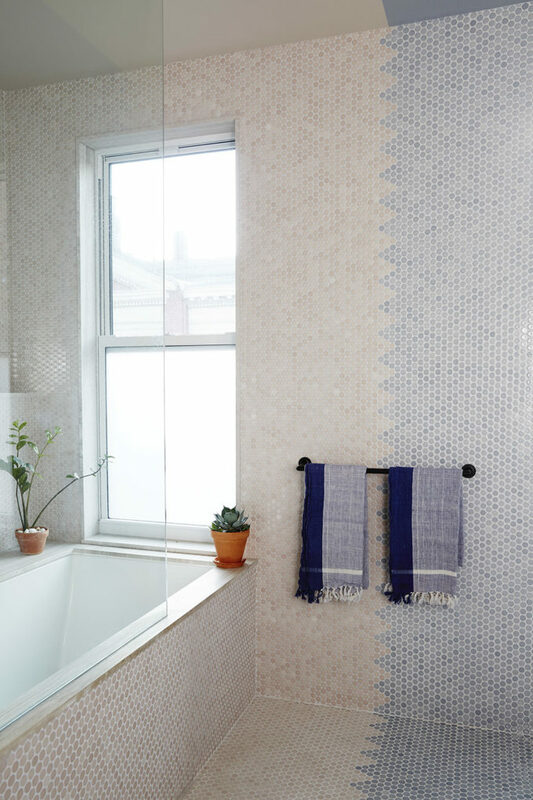 On a nautical vibe: We chose blue and white because we wanted the bathroom to feel like a boat on the water. The round mirror feels like a ship’s window. The doors in the bathrooms are also painted half and half, so the color is unbroken all the way around. Ophelia loves it; her new preferred part of the bedtime routine is brushing her teeth with her cool light-up toothbrush. Desk: vintage Paul McCobb, from eBay; similar. Pink chair: DWR. Desk lamp: DWR. Three spheres artwork: Family heirloom. Pink chair: DWR. Table: Vintage Paul McCobb; similar. Rugs: vintage Boucherouite rag rug: similar. Striped rug: vintage, similar. Bed: Charles P. Rogers. Bedding: Matteo. 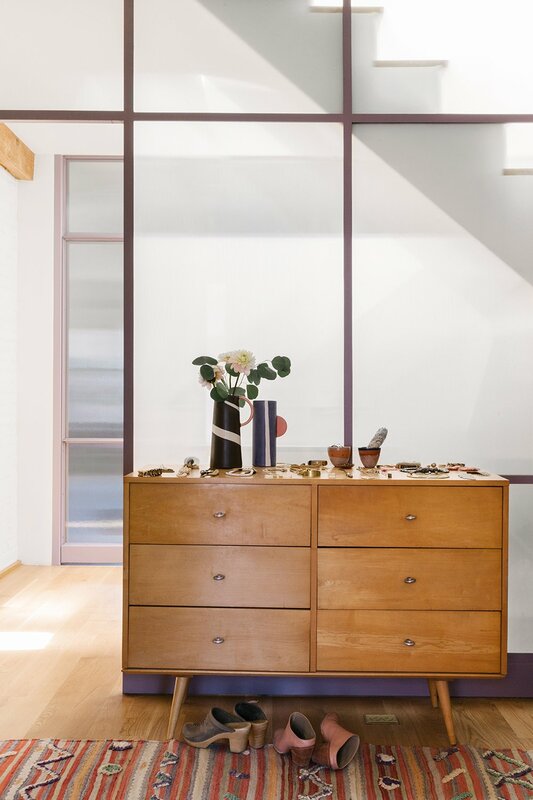 Dresser: vintage Paul McCobb; similar. Kissing artwork: DEERDANA. Sheepskin throw: Overland. Radio: Tivoli Audio. On adding light: We built the skylight in here. Without it, it felt crazy dark because there’s just the low window, and the ceiling slopes downward like an attic. But the skylight opened up the whole room. We also built the shelves and made a heathered shade using the same purple that goes through the house. 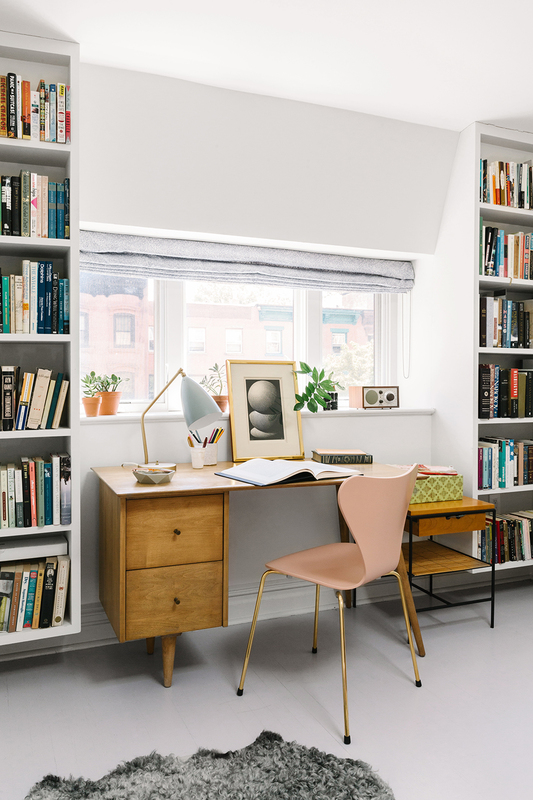 On a multitasking room: We use this space as both a guest room and office. The desk is by Paul McCobb, whose designs are so appealing. Now we keep an eye out for his pieces on eBay and 1stdibs. Last fall, I was studying for my geriatrics and palliative care board exam and writing a big paper and basically spent three months up here, sitting and working. 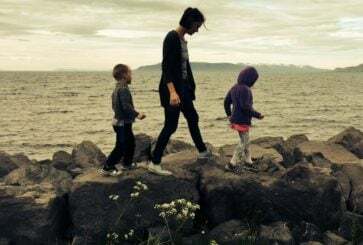 On work/life balance: Because my job is so intense, it’s important to me for our home to feel calm. As a doctor at Rikers Island, I take care of people with serious illnesses within the jail system. Working in palliative care has helped me become a much better listener during hard conversations. I never assume anymore that I know where someone is coming from. I’m also more comfortable sitting with sadness. On helping patients: Bearing witness is real — it’s meaningful just to be present — but there are also things you can do to make hard situations less hard. I can treat symptoms, like pain, anxiety or insomnia. And you can ask people: Given what’s happening, what’s important to you now? Then you can try really hard to address those things. You aren’t trying to make death completely happy or peaceful; that’s a misrepresentation. But you can help facilitate moments of peace, joy, connection, resolution and make people feel heard. Table: DWR. Chairs: DWR. Bench: DWR. String lights: Amazon. 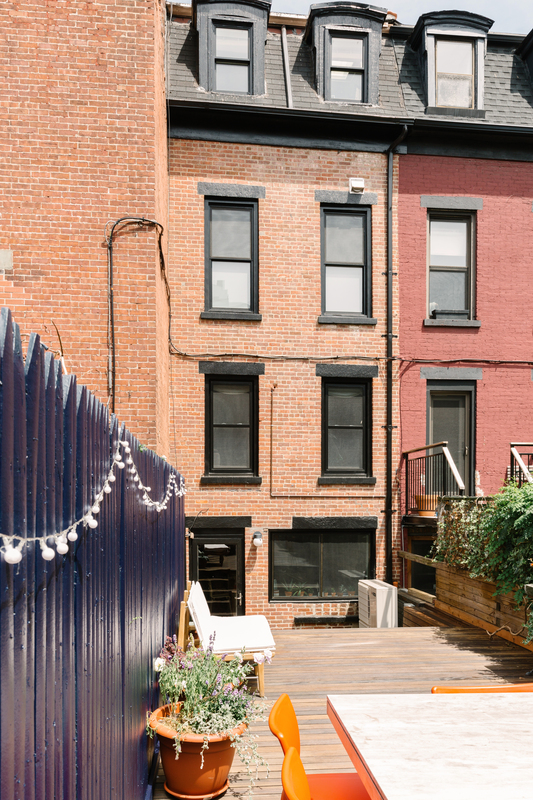 On outdoor space: We love the garden, but Brooklyn can be so buggy it’s hard to eat outside! The back of our house faces a beautiful church with stain-glassed windows, and we hear the choir practicing. This house is incredibly special to us. I think and hope we’ll live here for a really long time. It was an amazing project, and it really feels like us. P.S. 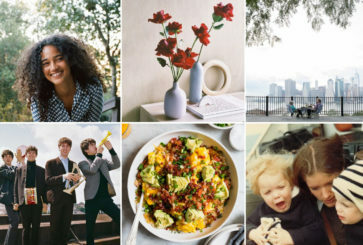 Rachael’s week of outfits, and more house tours, including a woodsy cottage in New Hampshire and a dreamy Parisian apartment. I literally love everything about this home! I love her face in these photos; it’s so obvious how much she loves her home. Oh, Rachael! The “Forever Young” bedtime comment brought tears! (“And when you finally fly away…”) My oldest daughter, also named Rachel, left for college a few weeks ago. Such a bittersweet time and a reminder of how quickly it all goes by! Cherish those sweet bedtime moments with Ophie. They are diamonds. The memories only get more precious with time. Beautiful cornices outside the building. Wow! She’s awesome and so is her house. Thank you SO much for this house tour! I loved her week of outfits and her home is just so gorgeous. Same! I would love a link to the fridge – I think this is exactly what I’m looking for and I did not know it was even an option! I love that she’s always out of fries. i must know more about that custom lyric poster, please! Holy moly, this house is amazing, and you can tell it’s because Rachael and her family are totally awesome too. I work in interior design, but I have to say that projects completed by architects can be that much more special in cases like this where the finished interior details are conceived in the architectural process. So good. This is one of the best houses I’ve ever seen. So many inspiring ideas. Thank you!!!! Put simply, I wish this were my home. So achingly simple and beautiful. This is one of my favorite home tours :-) I’m a sucker for a clever remodel, and Rachael and Gideon have done an incredible job. You would NEVER think this house was narrow or tight on space. I’m so impressed! Probably my favorite home tour so far! 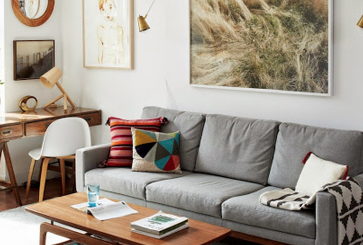 I love every element of it, from their style and point of view to how they make the small space work. Love the penny tile use in the bathrooms, but wondering how difficult they are to keep clean. That’s a lot of grout! Literally my dream home. I love every inch! One of the best remodels I have seen. Always love this segment, thanks for sharing this incredible space and lovely soothing decor. I like the color purple throughout the house because it is my favorite color. It’s hard to believe the house is only 11.5 feet wide-it appears much wider. The home (and Rachael) is so inspiring! I’m always grateful to see home decor that isn’t another rehash of the all white, bleached out, Scandi-Cali-Boho look w/ a Fiddle Leaf Fig. But wow to the color and wallpaper! Rachael seems like a wonderful person, who just might be my music spirit animal. Rumors is a Fav album and love The Band. My godmother is named Ophelia (born: 1955 in India) and we call her Ophie! I have never ever loved a wallpaper so much! 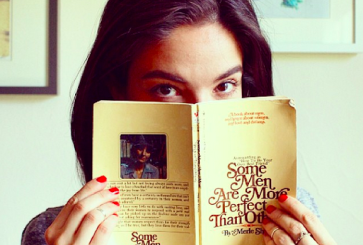 wowowow WOW she and her husband have the most unbelievably cool style (& taste in music!). Wow. I think the first link (Rachael’s name) is broken? This house is incredible – especially the bathroom penny tiles. Love! The one thing about these home tours though is that the people featured usually seem much, much wealthier than I am. 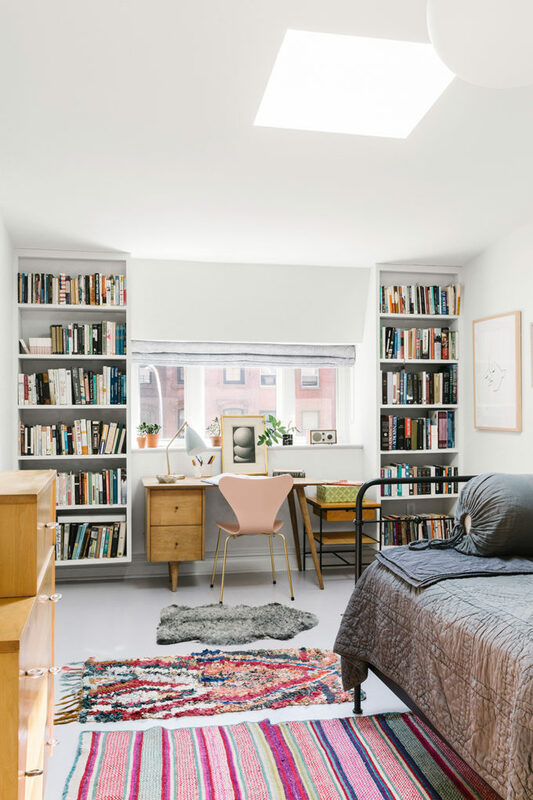 I click through the links and find dressers, rugs, and chairs that are thousands of dollars… I’d love to see more home tours from people who have a little less dough to spend on decorating. It’s helpful to see what can be done on a tight budget as well as more aspirational posts! (I think someone else said this as well, but I just wanted to add my support to their voice). hope this helps, thank you so much! Agreed! Although, I will say I try to use the more “luxe” design and pieces as inspiration. Things like the color combos here, the shapes, the way things are paired etc, are super inspiring – and that has nothing to do with price! 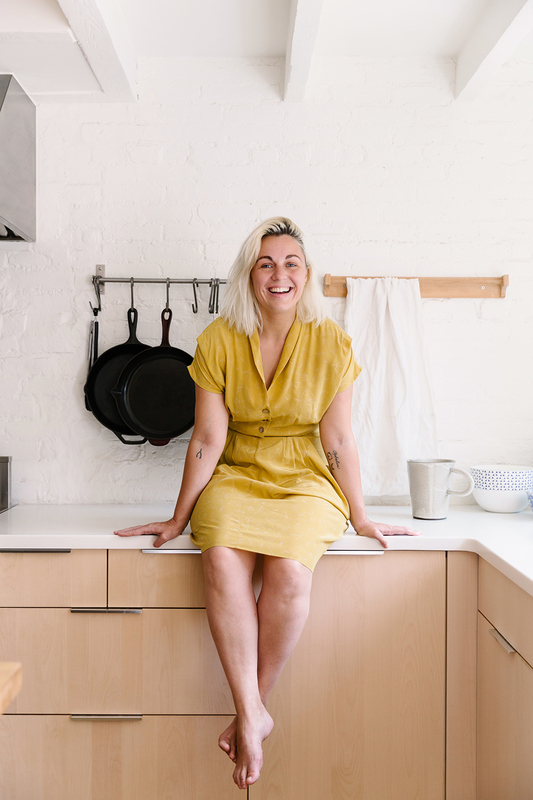 I try to note what I love from these homes that are professionally designed and keep a running mental list of pieces I’m on the hunt for at garage sales/thrift stores/etc. It’s fun :). The Band is the best group ever!!! Love the name, love the home!!! This place is my jam! Beautiful and a wee pit feminine but not at all overdone. It looks so comfortable – I want to snuggle in! oh wow i love the tiles in the bathroom! great place! Beautiful home tour, I would love to know where the bedroom wall lights are from. I need them in my life. Thank you! Wow, this home is so striking! I can’t stop staring at the pictures. Goes to show what an impact design (and friends who are genius architects) can have. It is so interesting to hear the tidbits about her career as a doctor as well. I would love a series or feature on how women chose their careers, what they actually do and the insights they’ve gleaned like Rachael’s above. Also, you guys have been nailing on the head in terms of diversity lately (gender, race, career, even size). It has not gone unnoticed. Cheers to you ladies! I cannot stop thinking about that purple, watercolor-y wallpaper in the entranceway… it’s gorgeous! 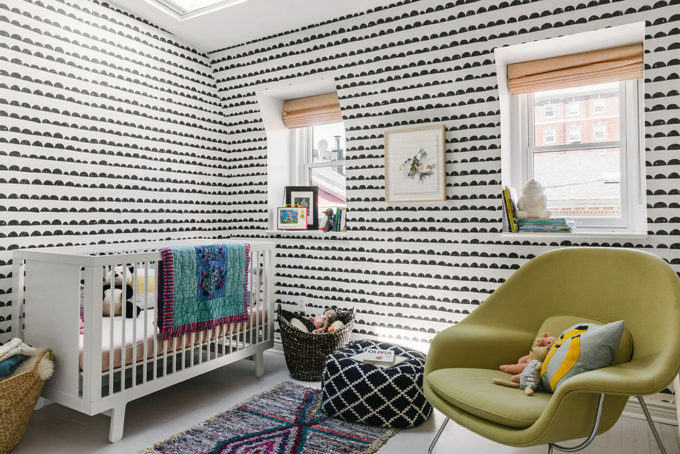 The whole house is quite lovely – but that wallpaper especially! Blown away by this one – so beautiful and soft. It’s making me rethink all of my solid, light neutrals. I LOVE that farrow and ball paint color. This home is beautiful and I also really loved hearing about Rachael’s job in palliative care. I was really moved by the idea of “sitting with sadness” and allowing for positive moments even through a difficult time. Thank you for sharing! Love this home tour! Loved the Fleetwood Mac lyric. What a wonderful idea! We are expecting our daughter in February and are naming her Emma Stevie. My husband’s name is Steve but he says it’s more after Stevie Nicks. Holy cow! Tal is a genius. :) This home is amazing. I love everything about it. I love how it doesn’t look like every other home tour I’ve seen lately, and it’s livable and approachable. What a lovely, creative, cozy home. Can I move in?? This is one of my favorite tours ever on cupofjo. I am so, so impressed by what you did with the space and how it feels so personalized, yet welcoming to others. 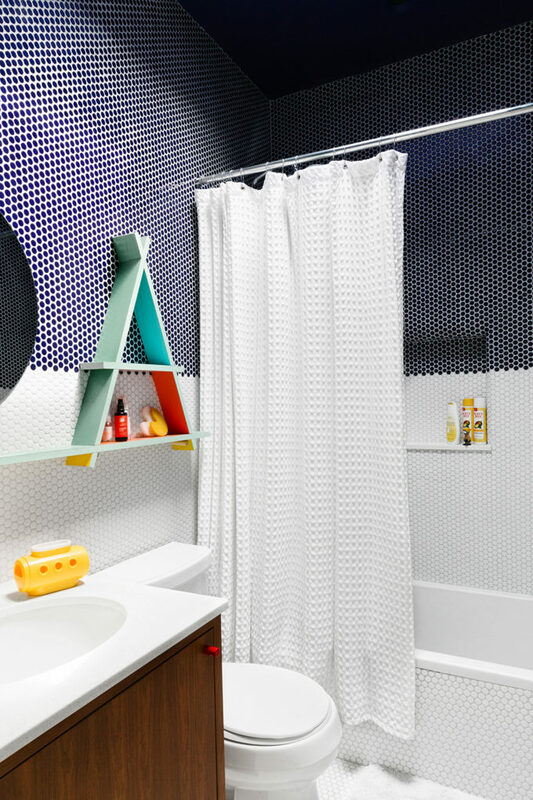 I am obsessed with your penny tile idea and might steal it for when we renovate our bathrooms! Every inch is perfect. Her designer rules. They did such wonders in this house – my favorite is the purple in the master bedroom though! I think this has been by far my favorite house tour! Would have loved to see a before and after because the transformation seems fascinating! Also, a week of outfits with Rachel would be amazing! and a beauty uniform! Lastly, I need deets on that Eros & Psyche print that’s leaning by the master bed!!!! wait i just saw that we already have a week of outfits! lol sorry! I would love to know where that print is from too! I’m a classical art historian who is very interested in modern receptions of ancient art. Do please ask Rachael for us if you can! What a stunning home. My mother’s name is Ophelia and my Dad calls her Ophie. :) She was born in 1945. Such a beautiful name. that is so sweet, maria! My goodness! I would love to experience being inside this wonderful home! I also enjoyed clicking over to the architects website for additional photos. So amazing! You had me at “the minute after we bought it we were like, wtf this is a cave.” My favourite house tour so far. The bathroom tile x2 is amazing. You should be so proud of this beautiful space you’ve created! hahaha i loved that line too! 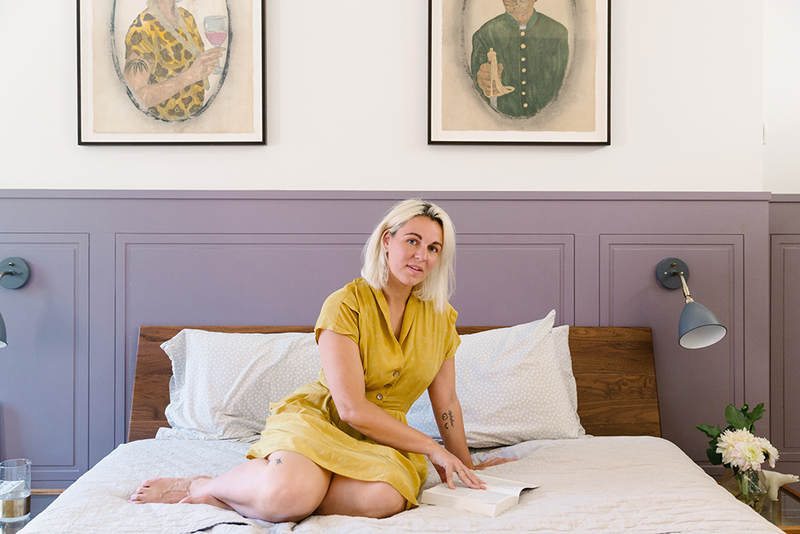 She chooses to spend her career helping some of the most marginalized people in our society face death in prison, and it’s so smart to make sure her peaceful, lovely home is basically part of her support system. Love it! I love this series! Such a treat to get to look inside these unique homes and draw inspiration for my own space. So many creative ideas to make tricky spaces functional! This and your Motherhood Around the World are my favorite series on the blog. I always love learning something new and getting a fresh perspective! this is my favorite house tour so far, i pinned so many things onto my wish list pinterest board! thank you for sharing! I adore this house and this lady. Thank you for sharing your home and lovely perspective with us! 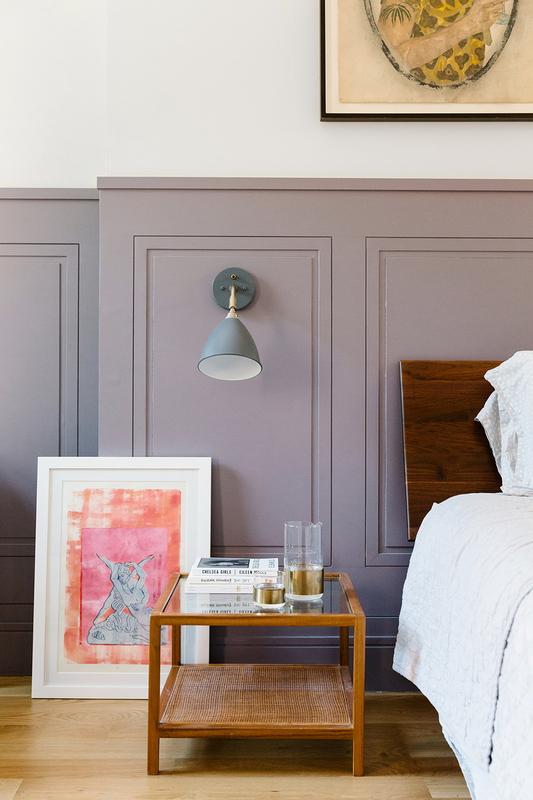 that mauve-y wainscoting—so perfect! beautiful tour and lovely to hear a little about Rachael’s work. thanks for sharing! I am pretty sure that Rachael is my design spirit animal. Except her place is a thousand times more well executed than mine. I’m obsessed w/the purple wainscotting in the bedroom. GORGEOUS! Wishing you and your family much love and happiness in your new home! oh my god, I LOVE that Fleetwood Mac print! Will be listening to Second Hand News for the rest of the day. Me too! The house I grew up in had pink crepe myrtle trees out the front (the exact shade of the print) and in late summer my Twin brother and I would lay on the carpet of pink petals and listen the Fleetwood Mac and the beach boys on repeat. That print brougt me back to that moment! I think I’m going to have to try to Diy a similar one! gosh this is absolutely gorgeous and done so so well! thank you for giving us an idea of what the floor plan was like! helped me picture it so much easier. though i wish there was a picture of the stairs from at least one of the floors looking up or down! This is really an incredible house! You can tell there was a big emphasis on the architectural elements–my favorites are the curved front door, the penny tile in the master bathroom, and the glass walls around the staircase!! Gorgeous house! 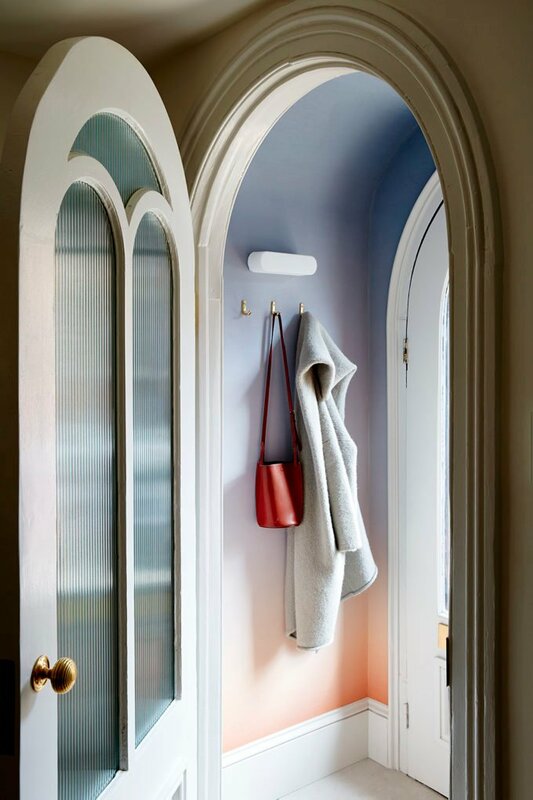 Any source for the coat hanging in the entryway in the first picture? It looks like the coziest ever! her perfect dress!!! would she share with us where it is from? what a beautiful home and a beautiful soul. Yes! I’d love to know about the yellow dress, too! This home is so light and lovely. This is truly beautiful! My entire design philosophy is ‘pick three colors and stick with them.” My house is black, white, and mint- but Rachael gets the same result with her pink, purple, and white! I completely agree with her that our homes should be calming and joyful. After a long day, there is nothing better than walking in your front door and being happy with the space you are entering. Makes a huge difference! I think this is my favourite house ever featured on CoJ. I love, love, love the bathroom solutions! I want to go home and wreck my bathroom on purpose, just to be able to create something as beautiful as this! Incredible space. You can totally see the thought and care and love that went into designing each room and making the most of the space. Super inspiring. Also really appreciate Rachael’s wisdom on bearing witness and listening to others. Beautiful space! Beautiful woman! For a moment you just want to have all these images in your own home or office. Purple also happens to be one of the most versatile of home decor shades. 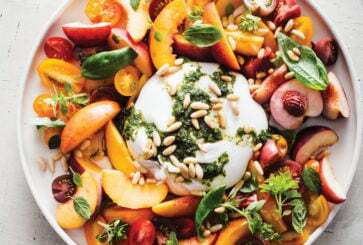 It blends, contrasts, and complements with amazing ease. I have shades of purple in kitchen and bedroom curtains. Ditto – the best. Inspiring person, home, and sense of family. Loved it! I would love to know who makes that beautiful handbag as well! Beautiful person, beautiful home, thank you for sharing. This is proof that it’s good to have architect friends you can actually work and bounce ideas with in renovating your own house. Gruffalo Soldier!! Awwww. What a great house. Love that it is filled with music. Also- did you ever think of doing a post on tattoos and why women choose the ones they have, do they still love them etc. Most tattoos have great stories behind them & would love to get inspired, since I have tattoo # 2 on my mind! Gorgeous home! Side note: always thought ‘Design Within Reach’ was a cruel joke of a name – $500 for a single desk chair? $4,000 for a simple living room recliner? Within reach?? Lol – hardly! Love this house – so great to see colours and patterns on the walls instead all white, white and a touch a grey! Looks like a happy house. I loved seeing this house. I probably wouldn’t end up making all these choices for myself (granted, I wouldn’t have been able to come up with the ideas, and I’d be terrified of not “nailing it” like this because my sense of colour is not awesome), but I’m amazed at so many of them – particularly the wallpaper and tile choices! They all just have that extra “something” that makes them stand out while still looking super classy. The entry wallpaper, the wallpapered doors, the glass staircase, the tile in the bathrooms, the shelving in the office, the skylights. Also the low fridge and the lack of upper cabinets looks gorgeous. I’m glad that they have such a restful home to offset the intensity of work! This is most inspiring house tour I’ve ever seen! Absolutely love it. I think I might be obsessed with you Rachael! Your home is beautiful! You are beautiful and have such lovely fashion sense and taste! You also have a wonderful smile. Also as a current med student, I loved hearing about your experience as a palliative care doctor in the prison system! Very interesting, I hope I can incorporate what you’ve said into my own experience. Best wishes to you and your family. ps. I’m not actually obsessed with you but you do seem very cool. Wow, I love everything about this place. It absolutely does not seem 11.5ft wide. I love all of the color and wallpaper! Oh my God, her dress! Please tell us more about her gorgeous dress! The house looks amazing, I also must say. I couldn’t believe how big it looked after reading the dimensions. Lots of lightning and warmth. super thoughtful and lovely. also–her dress! love the cut and the color. any idea where it’s from? Whoa! This is amazing. Maybe my favorite house tour ever?! Also, I want her dress and those clogs. I’ll take it all. I NEED that Fleetwood print! I so subscribe to the white and wood club, but oh man does this ever make me want to paint my house with colour! If only I could get it this right! Amazingly beautiful, thank you for always providing inspiration! Love this home! A total stunner and it’s nice to be moved, every now and again, from the every day and allow for some dreaming. 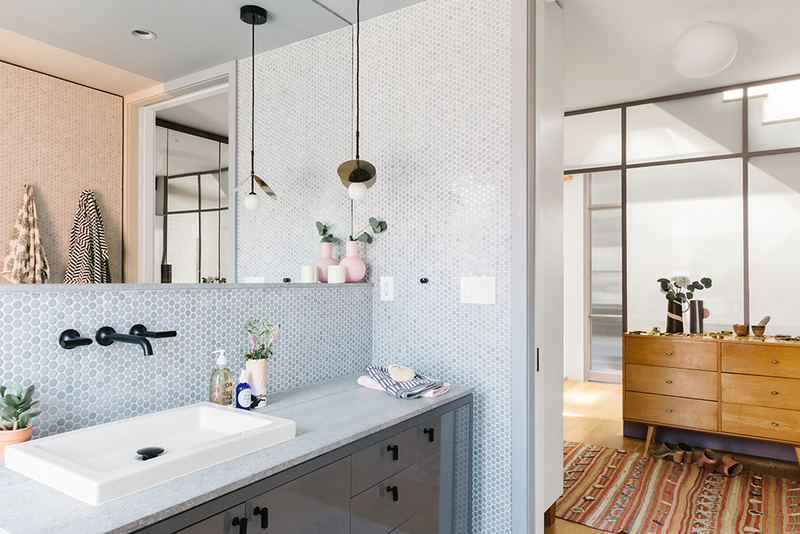 Sidebar-a dear friend tiled her bathroom in penny tile meant for a pool and it’s the dreamiest aqua color-fun to see a similar idea taken to the nth (sp?) degree! wow, that’s such a cool idea, margaret! Lovely feature as always. It’s hard to believe that this house is only 11.5 ft wide. They’ve done a wonderful job making it feel bigger. This was one of my favourite house tours. I literally smiled when I saw the kid’s bathroom – what a happy little space. I have a smaller, darker home myself and I can see how thoughtful decisions here made a big difference. Great job guys. Truly original, inspiring and beautiful. Hi Rachael- your house looks so peaceful. But I wanted to say that I loved what you said about your palliative care work. As a daughter who just watched my mother at the end of her life- and being cared for a palliative care team, I really appreciate what you said– ”…But you can help facilitate moments of peace, joy, connection, resolution and make people feel heard.” This was really beautiful to hear and while I don’t think my mom got exceptionally great palliative care, it makes me happy to know that your patients will. Thank you. I thought this was a truly beautiful sentiment from Rachel to and it is very important for people who have loved ones nearing the end of their lives hear from a health care professional. Rachel seems to be a extremely inspiring woman. she’s a really incredible woman — it has been such a pleasure to meet her in real life. Love love this house! Has so much character. LOVED this house! Where is the coat in the doorway of the first photo from? I second this question! Is it Lauren Manoogian? the house is lovely, but so is her yellor dress! can we learn where the dress is from, that’s my favorite color! We have penny tile in our shower and it’s so hard to keep the grout clean. Seeing all of this penny tile is stressing me out! Any tips for keeping it nice looking? I had the same thought! Love the look, hate cleaning it. I had that same thought! We are about to re-do our bathroom and I love the look of penny tile. Maybe I’ll do white tile with black grout to hide the dirt. We used Delorean Gray grout — a simple light grey color with our blue penny tile. Pure white looks fantastic with lighter penny tile, but I agree that it is a pain to keep up. If you do have white grout, a great product I have found is Black Diamond Ultimate Grout Cleaner (spray, let it sit, then use a brush on the grout). If you do not want to use product, you can just steam the grout clean with a hand held steamer, which works great, but is slow, slow, slow. Contractor friend’s advice is to seal it when new 6 TIMES, then once a year ever after. That will protect the grout from stains/mildew. Once a week clean entire wall with baking soda as the gentlest abrasive. What a beautiful place! And thanks for your important work Rachael. Their bathroom! I would spend every free moment in that bathtub. It’s perfection. What a beautiful home! I especially love the way they’ve incorporated their love of music into their home. Any chance of finding out where the ceiling lights in the family room and dressing room are from? Gorgeous and so well done. 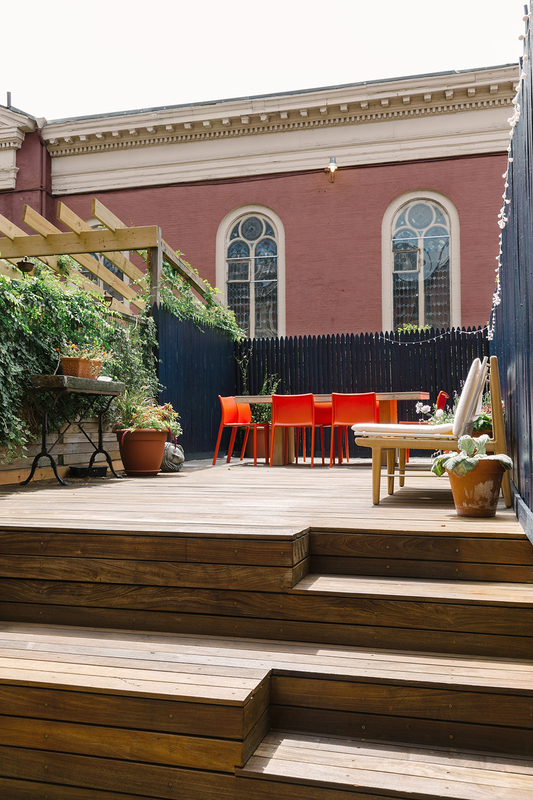 When I lived in brooklyn I HAD to have outdoor space (I am from CA). I would recommend building a pergola (similar to your neighbors) and hanging an outdoor ceiling fan (wet rated). It makes ALL the difference with bugs. I don’t think I’ve ever oohed and awed more at a home…ever. 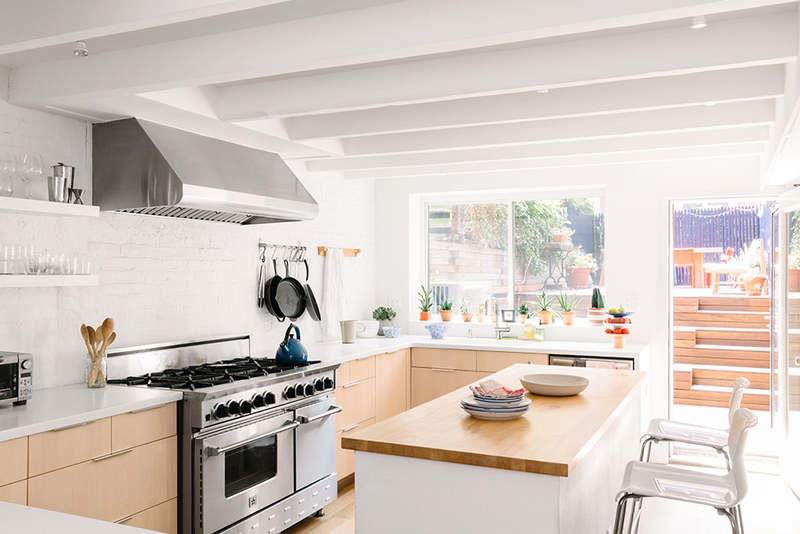 What a remarkable achievement this remodel was–and I didn’t even see what it looked like before! But, I sure can image what a ton of work this must have been. I’m so very impressed. Beautiful!! Omg this is my dream house, it’s freaking perfect. 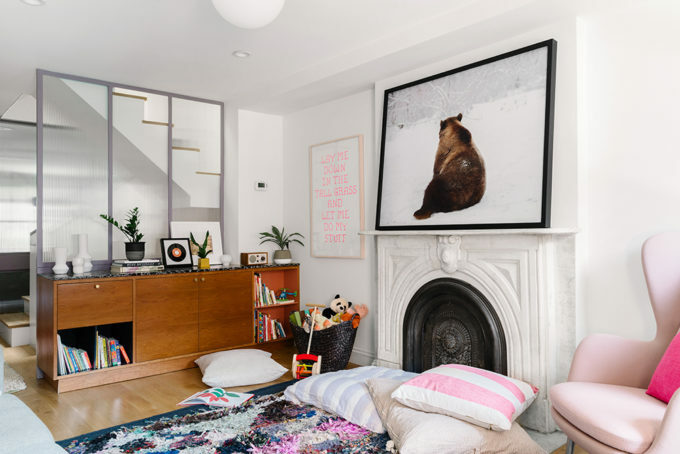 Love the home, love the bear print, love the penny tile, and then, (are you kidding me?!) that beautiful church next door! And the way Rachael describes her relationship with her patients? Truly, truly lovely. I love how open and airy your bedroom is but, where do you keep all your things? Do you and your husband share that single dresser? Is everything in your dressing room? I’m always wishing I could purge furniture but can’t figure out where I’d keep our things. Beautiful house, so intelligent and creative. But what I really wanted to say is thank you for going into geriatrics and palliative care. I don’t have any relatives in the prison system, but my mom has Alzheimer’s and the medical process has been difficult even with resources, so I can only imagine how much those with limited resources must need and welcome your care. Wow, really beautiful, cozy home. I agree with the comments about Rachael’s energy. Positive, interesting people like her usually live in wonderful spaces like this. Loved this! I love love love this house. It’s so beautiful and unique! The thing that really stands out to me in this post, though, is how she speaks about her daughter. 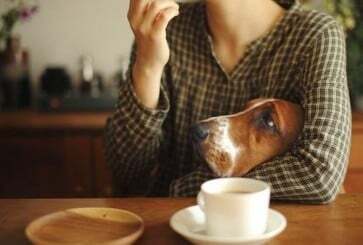 The tidbits she shares are small but so tender. 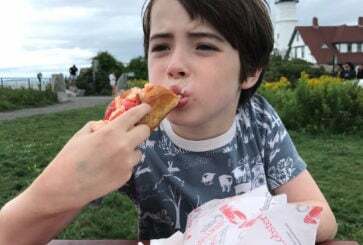 I love the way we as mothers see our children as the most interesting people in the whole world. Rachael, I love your unique home, but mainly I want to thank you for your work. That is an intense job and you must be a very special person. “Given what’s happening, what is important to you now?” I’m writing this down. The house tour is lovely but this is such a beautiful thing to ask someone, especially someone going through a trying experience. I love it. I thought the same thing. So powerful. Wow! What a beautiful home. Thank you for featuring a palliative care doctor! This is my field, too, and I have a similar commitment to making home feel as calm and grounded as possible so that I can bring a full heart to my work. Frohawk Two Feathers!!!!!! Yes! I love his work! Came here to say the same thing. The first piece of art my husband and I bought together was a piece of his called Willem Ferdinand. It makes me happy every day. LOOOOOOOVE this home! And even more so, “Gruffalo Soldier”. Ha, I wanted to say exactly this! Gorgeous and thoughtful home. I really loved what she said about her work. Thank you for profiling someone who works in this field. Pulling conversations about end of life care a little bit more into the mainstream is such a helpful thing to do. As usual, CoJ blends style and substance so gracefully. “Given whats happening what’s important to you now?” is such a beautiful way to distill the topic! As an oncology nurse I’m tucking that into my brain! Soooo beautiful! I absolutely love the penny tile bathroom! Utterly enchanting. Hearing the choir practice while enjoying one’s garden? I die. i’m guessing it’s because of the placement of the radiator on in between the corner chair and the nightstand on the left side. I’m afraid i’m a simmetry picky as well, but maybe the paintings and the nightstand had been set with a queen size bed, and the bed was swapped to a king size? Anyway is such a beautiful home! Thank you for giving us a tour! And Rachel seem a lovely person, i loved especially the part about palliative care, it would be very interesting to read more about her experience..
Love all the wallpaper and color! 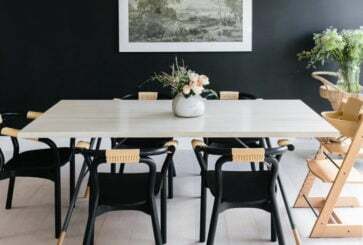 I do love the Scandinavian look that is so popular now with all the white on white on natural, pale woods, and minimalism, but the way our house is would just look terrible and kinda undone/naked with that look. I like how she kept things still streamlined but used so much pattern and color without being uber bold (we are not bold-look people ha). I know different looks are for different people, and I have appreciated every home tour whether I can take away a small part or just enjoy seeing a totally different aesthetic, but I also am totally inspired by and resonate with this one! Same – saved that image for the possibility that somewhere down the road I’ll have the opportunity to live in my own place and can renovate the kitchen! OMG this house….GIVE. IT. TO. ME. I love everything about their aesthetic! I can’t help but wonder if they did most of their reno when Pantone had announced their rose quartz and serenity 2016 colors of the year? They’re two of my favorites — I was having a good color year. I absolutely love this home. The wallpaper is incredible, especially the entryway. Also, those tiles in the master bath, to die for! I love love love this house. I am not usually a big fan of the homes you feature, but I am obsessed with this one. I like how the bookcases are installed to float in the office, instead of sitting on the ground. Makes it feel open, not clunky. This place is awesome. But it would really be nice to see more (truly) budget-friendly homes and design setups. yes, we strive for a mix of styles, budgets, locations, etc. and will keep doing so for sure! Actually, in terms of what ideas could be pilfered from this house, I was wondering myself if the kitchen was IKEA (it might be?) and penny tile can be relatively cheap at places like Hoke Depot. Of course the glass stairwell looks freaking amazing, and something that bespoke is probably super super spending, but for a lot of the furnishings you can find knock offs of at Target, Cost Plus and West Elm, etc. and hit up at various sales through the year. Suddenly feeling very inspired by penny-tile. So beautiful! What is the source for the modern print of “Psyche Revived by Cupid’s Kiss” that’s next to the bedside table? What a beautiful home. Such a thoughtful renovation! Where are the charcoal sconces from in the bedroom? I love them! Yes I would love to know where the bedroom wall sconces are from. Thanks!! Perhaps my favorite home tour yet! I adore the balance of whimsy and elegance, and the wide range of creative solutions! My favorite being the wallpapering of the two doors in the dining area. Brilliant! Rachael’s wonderful energy really comes through! What a beautiful and different home. I really enjoyed the tour.